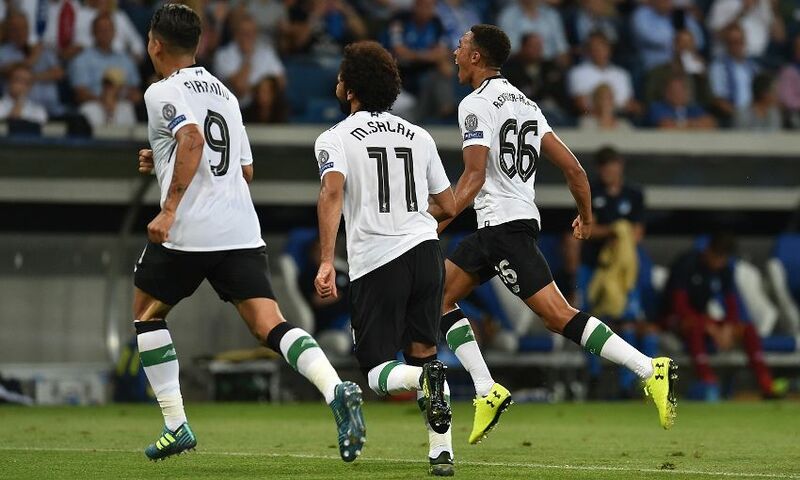 Liverpool took a step towards the Champions League group stages with a 2-1 victory over Hoffenheim in the first leg of the tournament play-offs on Tuesday night. After a lively start, achtzehn99 spurned the chance to open the scoring when Simon Mignolet saved Andrej Kramaric’s penalty at the Rhein-Neckar-Arena. And it was the Reds who did break the deadlock when Trent Alexander-Arnold grabbed his first-ever goal for the club with a sensational long-range free-kick on 35 minutes. In a keenly-fought contest, James Milner came off the bench to net Liverpool’s second, finding the top corner via a deflection off Havard Nordtveit. However, with full-time approaching, Mark Uth’s drive pulled a goal back for Hoffenheim to give the Bundesliga side something to cheer ahead of the return meeting at Anfield next week. Jürgen Klopp elected to select the same line-up as the one deployed at Watford in Saturday’s Premier League opener, meaning Alberto Moreno retained his place at left-back ahead of Milner, while Roberto Firmino, Sadio Mane and Mohamed Salah led the three-man attack. Spurred on by their vocal support, Hoffenheim started brightly at the Rhein-Neckar-Arena. Indeed, just six minutes had elapsed when Joel Matip was required to produce an excellent defensive header to deny Serge Gnabry the chance to open the scoring after Kramaric had escaped into space down the right and crossed dangerously into the centre. Soon after, a delivery from the left at a free-kick required a combination of Dejan Lovren and Mignolet to scramble it to safety. But on 11 minutes, Hoffenheim were awarded a penalty after Lovren was deemed to have brought down Gnabry. Kramaric stepped up to do the honours, but his kick was repelled by Mignolet, much to the delight of the away contingent housed in the corner. The contest was being played at frenetic speed – and the Reds fashioned their first chance soon after when Salah was sent clean through from a Firmino pass after Kevin Vogt had conceded possession; however, the No.11 slid wide of the post under pressure from recovering defenders. Liverpool were slowly growing into the game – and 10 minutes before the break, they opened the scoring in quite magnificent fashion. A trip on Mane 30 yards out in a central position presented an opportunity to strike towards goal, and it was Alexander-Arnold who took control, curling the ball around the wall and into the bottom corner for his first ever for the club. It was some way to mark his European debut on what was only a 14th senior appearance for the 18-year-old Scouser. Hoffenheim threatened to level just before the break, but Mignolet reacted well to block Gnabry’s turn-and-drive before Sandro Wagner scooped the rebound wide. Then, in stoppage-time, Lovren headed a Moreno corner inches wide of the far post as a fast-paced opening 45 minutes came to a close. Liverpool should have added a second goal to their tally within just 90 seconds of the re-start, but Firmino was left holding his head in his hands after his close-range swipe from Mane’s run and pass was kept out by Oliver Baumann. Soon after, the home team’s goalkeeper was needed to repel a low drive from Mane as the Senegal forward’s pace continued to trouble Hoffenheim. As the half progressed, the German side began to exert pressure on their guests in an attempt to restore parity; Gnabry hooked a half-volley wide on 66 minutes following a flurry of corners. But Klopp’s men responded with Salah having a low shot turned away by the boot of Baumann before the custodian saved from a Lovren header at a corner. The Reds had earlier replaced Jordan Henderson with Milner – and with 14 minutes left, the vice-captain struck a potentially decisive goal in the tie. The Merseysiders broke forward at pace from a quickly-taken free-kick and Firmino spread possession wide to the No.7 in space on the left side of the area. His ball towards the back post struck Nordtveit and looped into the top corner. With the game edging towards its conclusion, Mignolet did well to keep out Uth’s snap-shot inside the box, while Mane skewed wide when played in by Salah at the other end. But, with just three minutes left of normal time, Uth did give Hoffenheim hope when he chested down a ball over the top and drilled low across goal beyond Mignolet to reduce the deficit. Liverpool were required to see out some nervy moments before the full-time whistle, not least when Kramaric headed over the bar in injury-time from a free-kick, but they did enough to ensure they hold the advantage going into next Wednesday’s Anfield second leg. Watch Liverpool at Anfield in style this season with our range of hospitality packages - click here for more information.